Do you keep getting fired and have no idea why it keeps happening? It must be that all your ex-bosses were losers or that you just have bad luck, right? Hmmm. That's probably not it. If you can't keep a job, there may be more to it than a slew of bad bosses or misfortune. It can be beneficial to figure out why. 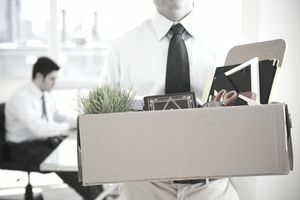 Most people get fired at least once during their careers, but those to whom it repeatedly happens can benefit from serious self-examination. Take an honest look at your behavior and ask yourself if you might be to blame for at least some of your repeated job losses. Only after doing this, can you take actions to change the pattern. Do you take pride in your work or are you just eager to cross another item off your to-do list? If completing tasks as quickly as possible is more important than turning in superior work, you may have just found the root of your problem. Most bosses do not value employees who don't strive for excellence. It's easy enough to find someone else who will. If your work is sloppy or you make a lot of mistakes, it is imperative to improve your work ethic. The technical skills that allow you to do your job may be exemplary, but if you don't know how to perform the basic tasks that keep workplaces humming along, trouble may be on the horizon. Bosses have the right to assume their workers can do simple things like answer the phone properly, make introductions, and compose professional email. If you can't complete work as quickly as your job requires, it will have a negative impact. Missed deadlines can be costly for your employer. Clients don't like to be kept waiting. Fortunately, improving your time management skills can help solve this problem. Learn how to prioritize your work and delegate tasks to coworkers if allowed. Also, avoid procrastinating. Putting off work won't help anyone. You will have to do it eventually. Are you always getting into disagreements with your coworkers? When its employees don't get along with one another, an organization will suffer. People will be distracted from their work causing productivity to eventually decline. When your boss looks to weed out the root of the problem, your job will be in jeopardy. It's not necessary to love everyone in your workplace—you don't even have to like them all—but to keep from getting fired, try to have good working relationships with all your colleagues. If you lose your temper very quickly and are unable to manage your anger at work, your boss is likely to see you as a liability. There are far too many news stories that demonstrate how unchecked anger can escalate into physical violence. According to the U.S. Occupational Health and Safety Administration (OSHA), each year almost 2 million Americans report they were victims of workplace violence. Many more cases go unreported (OSHA. Workplace Violence.). Seek professional help if you can't check your temper on your own. Bosses don't like workplace negativity because it tends to be infectious. It spreads quickly from one employee to another and damages workplace morale. One way for your boss to put a stop to it is to get rid of its source. Even if your grievances are legitimate, don't complain incessantly. Instead of abiding by the motto "misery loves company," find ways to improve conditions in your workplace and avoid bringing everyone else down. Do you turn down assignments that seem too challenging? Don't miss the opportunity to prove your value to the organization. Instead, take on difficult tasks that demonstrate your strengths. Show that you are undaunted by challenges and willing to learn new skills. When, on occasion, you have to turn down an assignment, learn the right way to say no to your boss. But don't do that unless there's an excellent reason. For example, decline an assignment only if adding it to your already packed schedule will keep you from completing higher priority work.